It’s April 1st, What Are You Waiting For? April 1st is the day people try to trick their friends, to make them behave like fools. Ranging from the elaborate practical joke to the obvious Your zip’s undone. If you fall for a prank, the joker gloats “April Fool”. No one is exempt until noon, but after that the joking must cease or the prank rebounds on the joker with the rhyme “April Fool is gone and past, You’re the bigger fool at last.” A favorite joke is to send someone on a fool’s errand, a search for something that does not exist, a friend of mine was sent to buy tartan paint once. Here are a few fun pranks you can play on family, friends or co-workers. This works best on someone without much computer knowledge. If you know of someone who is constantly talking about how stupid their PC is, or always seem to be lucky enough to get the newest virus before anyone else…this trick is for them. 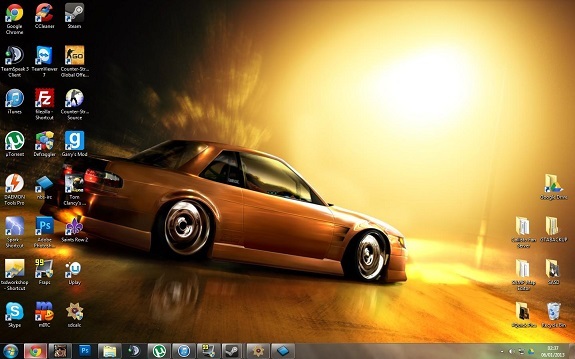 You take a screenshot of someone’s desktop (with or without apps running or photoshopping “enhancements”), than place that image as their desktop wallpaper. If you are decent with using photoshop or another graphic editing program you could open up the image file that the person is using for there desktop and use some of your creative genius to make something extra special. Other ideas: make a “windows warning” box that says something confusing /devastating to someone not familiar with the technical aspects of Windows. Like: “Warning… Unable to mount drive… Ram will implode in 4 minutes”. You need to clean off a persons desktop… this will probably be easier than getting the icons to line up correctly later. Grab everything (or almost everything) off the desktop and stick them in a new folder titled “desk_backup” or another name you will remember. Place this folder in the corner of the desktop, or somewhere else. If you know how to hide a folder and “un hide” it later, you could do that too. Just don’t loose that folder 😉 Make the “Start” bar inaccessible as well, by choosing the option to “hide” it. (Even better: move it to the side or the top of the screen, then “hide” it). Now you set your prank desktop as the person’s wallpaper, and wait for them to try and figure it out. – Clear plastic wrap across the toilet. (under the seat cover, but on top of the bowl). Perfect for the annoying person in your residence who always makes it to the bathroom first every morning. – For a sleeping roommate: Place shaving cream in their palms, tickle their nose with a feather, and then watch out. – For the person who has to put salt on everything: loosen the salt shaker cap so that when it is poured, the cap will just fall off. (works with pepper and sugar too). Phantom Keystroker V2 – This device for under $20 is sure to bring laughs for you, and confusion to your victim: Attach this evil prank device to your victim’s computer and it makes random mouse movements and types out odd garbage text and phrases. Geeky pranking — perfect for the office. Covert Clicker – Control volume, change the channel or turn the TV on and off — all stealthy-like. Imagine the fun with this at a party, sports bar, or the lounge at the doctor’s office. The mini TV Remote works on 90% of all TV’s. Annoy-a-tron – Select one of the three sound choices and push the switch to the on position. Place it in a proper hiding spot and let the “fun” begin. The Annoy-a-tron generates a short (but very annoying, hence the name) beep every few minutes. Your unsuspecting target will have a hard time ‘timing’ the location of the sound because the beeps will vary in intervals ranging from 2 to 8 minutes. What’s the best April Fool’s Day joke you’ve ever heard or been a part of? Tell us in the comments section below.